Hope's Cafe: Izola Shower Curtain Review and Giveaway!! "Izola offers fresh and sophisticated designer shower curtains that incorporate the work of groundbreaking artists; Patrick McMullan, Christopher Makos, Faile, Aiko, Rika Shimada, bold patterns, subway and geographical maps; the CTA Subway Map (Chicago Transit Authority), MTA Subway Map (New York Metropolitan Transit Authority), Eurail (coming soon) and World Map and photographic images of world destinations; the Brooklyn Bridge, Paris, London, Venice, Las Vegas. Popular themes also include world destinations shower curtains, subway map shower curtains and eco-friendly shower curtains." This shower curtain is made of 100% eco-friendly PEVA, and is extremely durable. 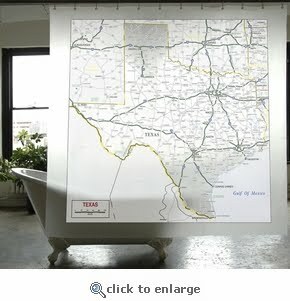 The curtain measures 72"x72", which gives plenty of space to detail the Texas state map! The kids were having fun looking for cities we have been to on this shower curtain/map! They also enjoyed trying to find places we are planning to visit later this year. The map is easy to clean off with a damp cloth. I have really enjoyed having this lovely Texas-themed decor in our bathroom! Izola also offers shower curtains with world destinations featured on them-places like Trafalgar Square London, Venice, Paris France, and more! Or, you can pick a patterned curtain if you prefer. You can also get high-quality accessories on the Izola website-bathmats, pillows, shower curtain liners, etc. They even have bedsets and aprons, too! Izola is giving a Shower Curtain to one of my readers!! Go to Izola and tell me which shower curtain you'd pick if you won! This giveaway ends Friday, Sept. 24, 2010 at 11:59 p.m. Please leave a valid email address in each comment, as this is how the winner will be notified. Winner will have 48 hours to respond, or another winner will be chosen. Giveaway open to US residents only. Disclaimer:I received product for the purpose of review. All thoughts and opinions are mine. All quotes taken from the Izola Shower website. Note: Be advised, under the Artist Series shower curtains, there is a curtain that I do not think is family-friendly. I love the Rio De Janeiro Shower Curtain! Thanks! I would get the Rio De Janeiro Shower Curtain. I would pick the "Venice Shower Curtain." I like the Paris one.